Here is a list of moments you might feel the urge to share. Below them are some examples of what you might say. The higher the number, the more personal the response. Scene: Girls sitting in the lunchroom talking about menstrual cramps. Say: Nothing at all—let it pass or ask your friend a question about her weekend plans. Say: “I’ve never had cramps/period pain.” You could even ask them, “How does it feel?” if you want to know. Say: “I have a condition that I was born with that means that I won’t have periods and I’ll adopt to have kids. There are lots of ways you can handle these discussions. You can also offer advice (like “I’ve heard this is really good…”) or ask them questions. Even when someone asks you about your period, you can answer truthfully (like “I’m not on a period right now”) without worrying about them knowing more than you want them to. 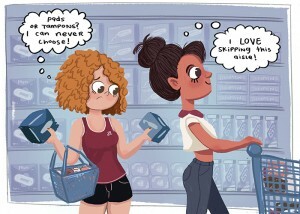 You can decide for yourself whether or not you want to carry around a tampon or pad for your friends. It’s another tool in your arsenal, if you feel like you need it. The most important thing is that you feel supported in sharing what you feel comfortable. How you talk about periods will probably change over time, and feel free to experiment with what feels right for you.